Studying has ruled the last few days. 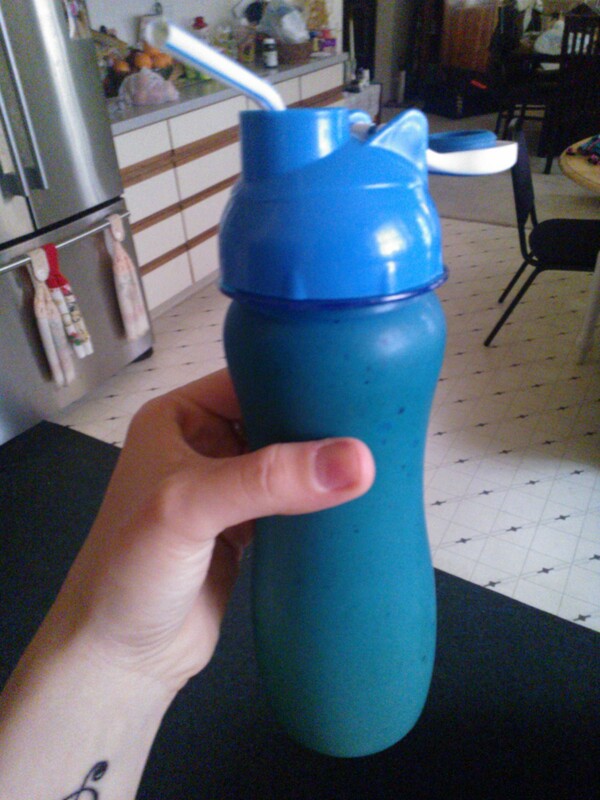 Yesterday started with a delicious shake that kept me going and full for hours. I can’t believe how good it was. 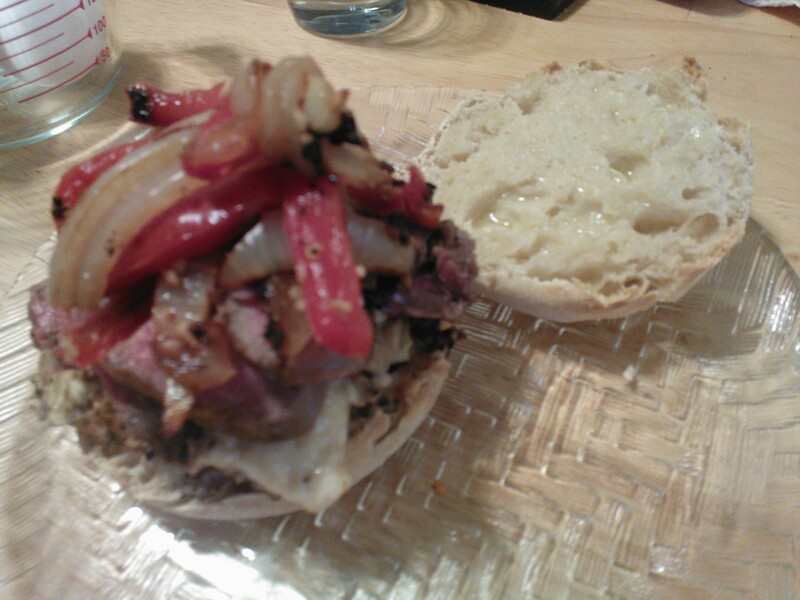 I’ve made this before, but it was exceptionally delicious today. The reminder of my day was spent at the kitchen table. studying. pulling my hair out. I always like to eat a protein filled meal the night before an exam, so I invited dad over for steak and eggs. I feel breakfast foods should be eaten any time of the day! I seasoned some london broil with montreal steak seasoning and pan-fried it. Then I combined 1/4 cup egg beaters and 1 egg, and while in the pan, fold in a slice of Bordens fat free PepperJack cheese. Slice up the meat. 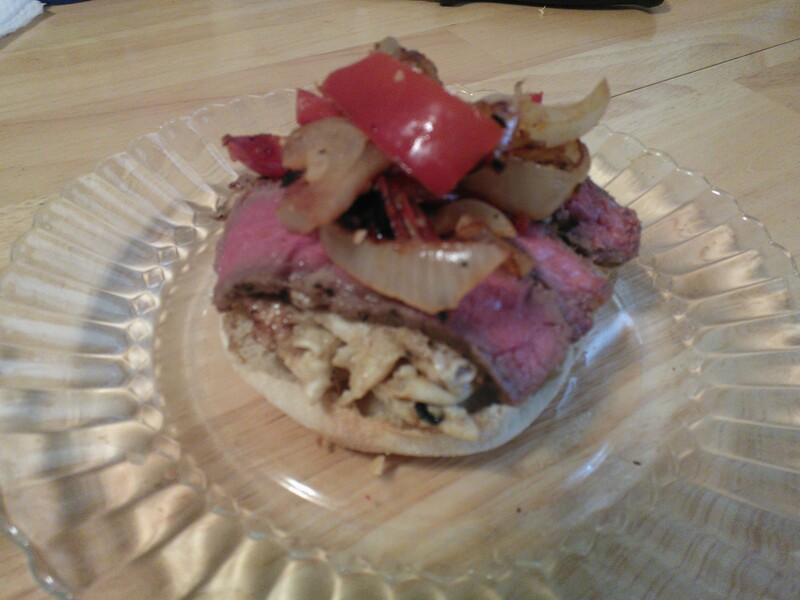 Top a toasted english muffin with the eggs and meat. 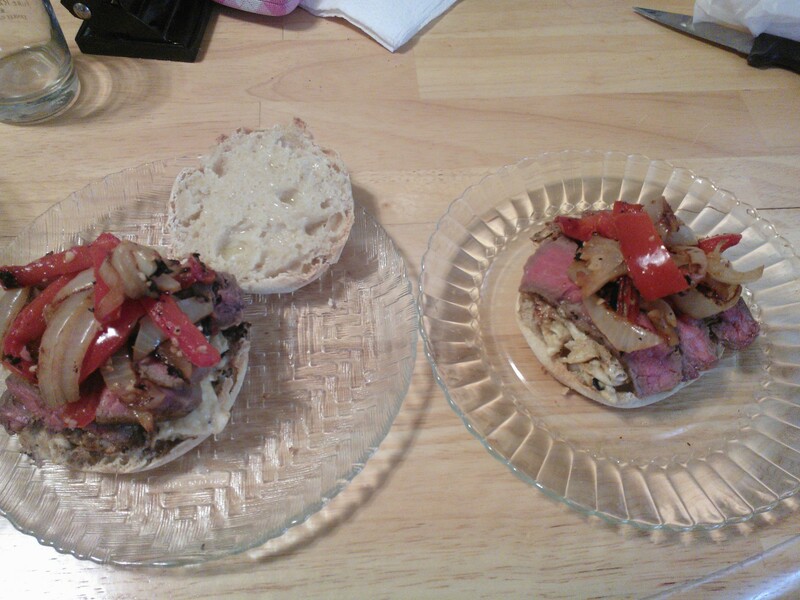 Lastly, I sauteed some onions, peppers, and garlic for garnish. This test day began with Raisin and Spice oatmeal and some Dunkin Donut coffee. I studied all morning, treating my stressed out self to a chocolate chip cookie before the exam. I managed to pull out a B! Woah! That exam actually gave me a stomach ache! To take my mind off things, mom asked me to dye her hair. Its nice to have a mom who was a cosmetologist I’ve never had to pay for a hair cut or dye, and shes been teaching me! Dinner, tonight, was delicious as well! 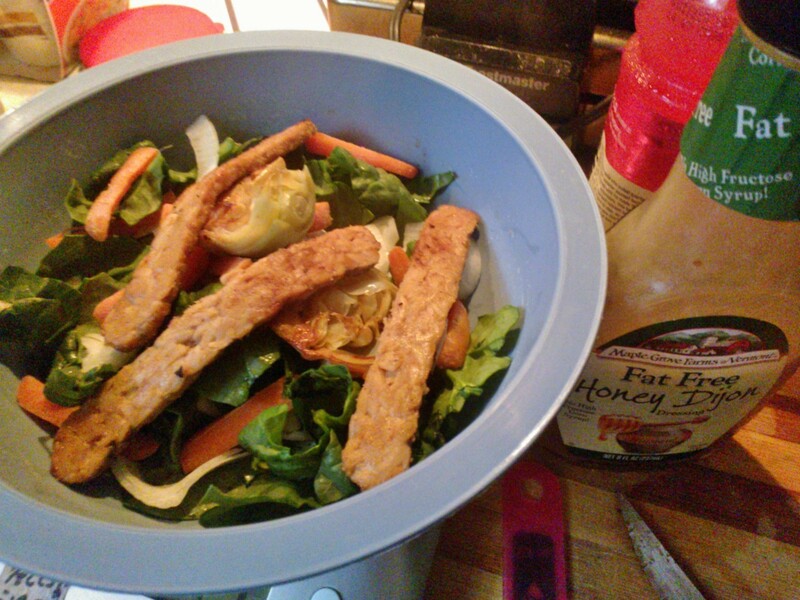 Tempeh is one of my favorite salad toppers, as are roasted vegetables. Roasted artichoke hearts, onions, carrots, and Sesame Garlic Tempeh tickled my fancy this evening and I did not regret it! Wow-zah! MMMM Good! 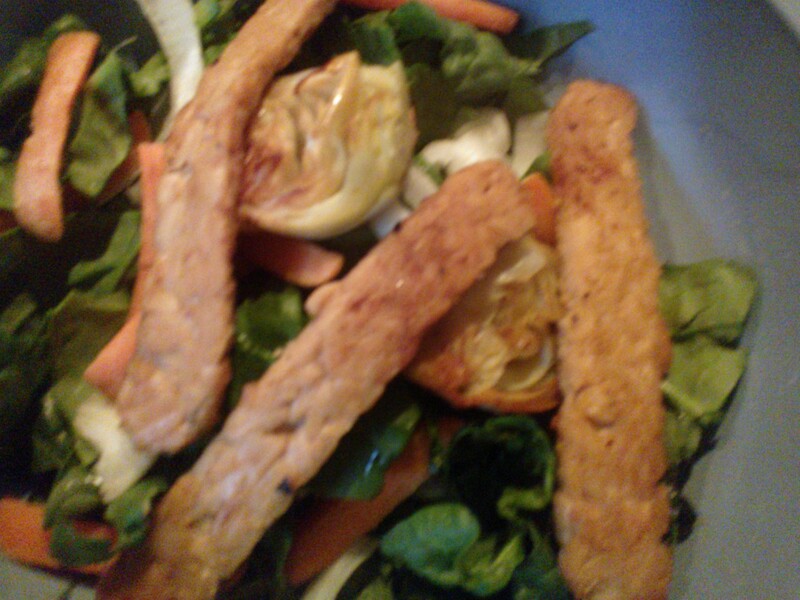 My girlfriend, Meaghen, got me hooked on tempeh when I was in New York with Barry’s Tempeh! Ever since, I’ve had tons of tempeh recipes in the making in my head. I can’t wait to make them and share them with you! Cottage cheese and apples made another appearance as dessert. I’ve been doing a lot of stress eating the last few days, but I’ve recognized it each night, which I’m happy about and have been able to stop. I remember, now, that this is how I gained so much weight in the first place; not just stress eating, but eating when I’m not hungry, or just because the food is there. But, alas, although the exam is over, this semester is not. I have two projects and two exams to complete for the big G-Day (graduation)!